Ryan Harris has admitted that India’s bowling was outstanding in the Test series against Australia down under, and he even went on to term it as good as Australia’s bowling in the 2013-14 Ashes. The former Australia pacer also heaped praise on Indian pacers Mohammed Shami and Jasprit Bumrah. Former Australia fast bowler Ryan Harris, known for his fiery spells in the 2013-14 Ashes series, had closely watched India’s recent Test series against Australia down under, which India won 2-, and was left dazzled by the Indian bowler’s performance. Jasprit Bumrah was the wrecker in chief with the highest tally of 21 wickets in four matches. Mohammed Shami also scalped 16 wickets, which was more than each of the three Australian pacers Pat Cummins, Josh Hazlewood, and Mitchell Starc. "We have got a really good attack back in Australia but we were out bowled by India (in the series last summer). The way India bowled, we bowled that way in the 2013-14 Ashes. We did not give England an inch. They (Shami and Bumrah) work well together. You have got Bumrah, who is a bit different and got pace and attacks whereas Shami can just come in and ball stump to stump and does a fantastic job. It is pretty well rounded Indian attack, you have to say,” said Ryan Harris, reported PTI. The Australian bowlers looked toothless against Cheteshwar Pujara, who smashed three centuries, scoring 521 runs in seven innings at an average of 74. Youngster Rishabh Pant also took the bowlers to the cleaners and ended up as the second highest run-scorer of the series with 350 runs. Harris credited the Indian batsmen, particularly Pujara, but was of the opinion that the Australian bowlers failed to put pressure on them. "But we could not do the same against India, we were not able to put sustained pressure and Pujara batted beautifully as well," the 39-year-old added. Harris was roped in as the bowling coach of the Kings XI Punjab, and thereby, has been working closely with Shami off late. He was able to to relate himself with Shami, as both the fast bowlers have been plagued with injury and weight issues in their respective careers. "I don't have to work much on him, he does it himself. He has been outstanding around the (KXIP) group, talking about plans, talking to me. Most guys want to pick his brains. If not the best, he is one of the best bowlers in the world at the moment," stated Harris. Shami had an excellent World Cup in 2015, where he had scalped 17 wickets in seven matches. However, owing to a career-threatening knee injury, he had to stay away from international cricket for more than a year. He made a resounding comeback in 2016 in the series against West Indies and has now become an important cog in India’s test bowling attack. Not only that but Shami also returned to India’s limited overs setup and has been in the scheme of things for the upcoming World Cup in the United Kingdom. 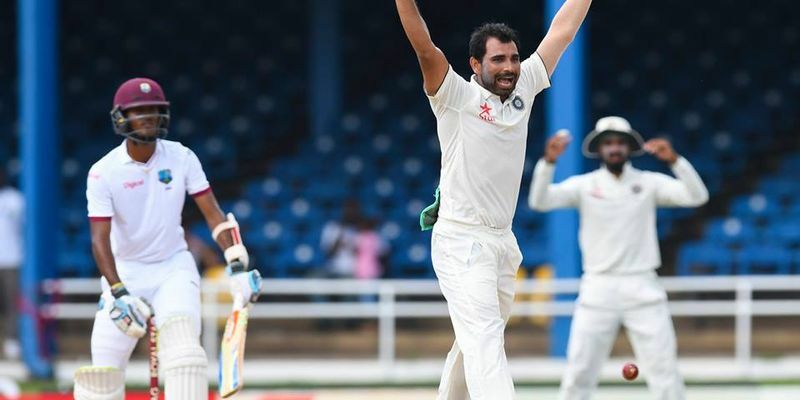 Harris candidly shared Shami’s strategy and the hard work that he has put into his fitness has enabled him to stay injury free for the past one year despite playing non-stop cricket. "The first couple of days I met him (at KXIP camp), he told me how he improved his fitness and dropped 7-8kgs. How he did some training in hot conditions in Chennai, making him lose weight rapidly,” shared highly rated pacer. "Knowing myself as well who went through a stage where I was a little heavy, it makes a big difference when you are not carrying that extra bit of weight. You can go longer (in your spells) and it is easier on your joints. He is bowling with good pace and good consistency and it is good to see that", said the former New South Wales bowler. Harris also singled out Jasprit Bumrah, who has quickly risen through the ranks to become the top-ranked ODI bowler in the world, stating that he has worth in Test cricket since his debut in 2018 in South Africa. Many experts believed that the pacer would not last long owing to his unique action, but he proved everyone wrong and has scalped 49 wickets in ten Test matches, at an excellent average of around 21. Harris has been of the opinion that Bumrah’s action is what that makes him unique wanted him to continue as it is. "If you listen to a lot of talk over the Australian summer, a lot of fast bowling commentators were saying that if he could just pull his arm front in, he will bowl quicker, I disagree with that. His action is unique, he bowls the way he does because of that action and he bowls with pace, you know he is just different. It is difficult for a batter to face him, he is a bit like Malinga. That is his strength, he is not like anyone else,” the right-hander concluded.